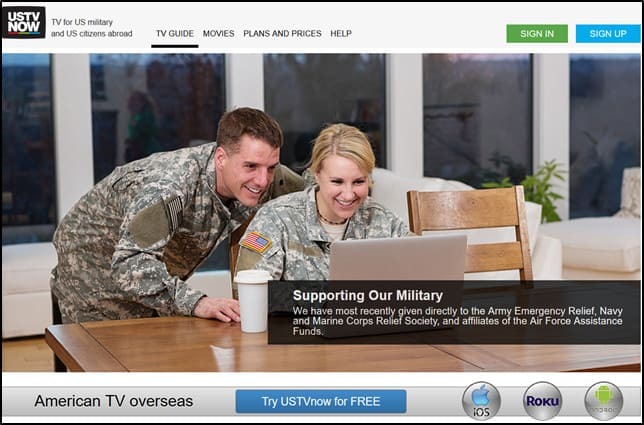 USTVNow offers American live TV channels to American expats and military personnel. Their free plan comes with six channels, while their paid options offer more channels and DVR functionality. While USTVNow’s live TV service is targeted to Americans living abroad, it can be accessed by those living within the US as well. A proven way of bypassing this geolocking is through the use of a Virtual Private Network (VPN). VPNs reroute your internet connection through a server in a location of your choice while also encrypting the transmitted data. If you are outside of the US but wish to access USTVNow movie rentals, then connecting to a US VPN server will grant you access. This means you can access USTVNow from Canada, Australia, the UK, Germany, and anywhere in the world. You will also be able to unblock other services that are typically only available to people who live in the US, such as the US Netflix library, Hulu, and HBO. ExpressVPN Our top choice. Superfast US servers unblock streaming content at high-quality speeds. Apps are secure, private, and easy to use. Includes 30-day money back guarantee. NordVPN Veteran budget provider with hundreds of servers in the US. Good for streaming securely and privately. CyberGhost Good value VPN with easy to use apps. We were impressed with their streaming speeds. PrivateVPN Gaining popularity for their unblocking capabilities, streaming speeds, and privacy features. IPVanish A favorite with Kodi users for their easy to use apps and streaming speeds. ExpressVPN offers 32 servers in the US. These are high speed servers which allow for the streaming of HD content. In addition to letting you access USTVNow’s movie rentals, ExpressVPN can also unblock Netflix, Comedy Central and BBC iPlayer. ExpressVPN also allows for three simultaneous connections which is great for anyone with multiple devices. ExpressVPN offers secure connections by providing 256-bit encryption. Payment is accepted via bitcoin which has its own anonymity benefits. In addition, ExpressVPN has a kill switch feature which ensures that users’ data isn’t leaked in the event of their VPN connection dropping out. Minimal connection logs are stored with Express VPN but it should be noted that IP addresses are not stored. DNS leak protection is also offered to ensure that users’ data is not leaked through the VPN connection. IPv4 is also forced when connecting to an ExpressVPN server. This is done since some networks don’t support the newer IPv6 which causes IPv6 traffic to be routed outside of VPN servers. Increased anonymity is also offered through the .onion site which allows for anonymous registration. You’ll also find that ExpressVPN provides excellent customer service through a 24/7 live chat system. Native apps are available for MacOS, Windows, iOS, Android, some Linux distros and some routers. Chrome, Firefox, and Safari extensions are also available which allow for control of the VPN app running on the machine where the extension is installed. For routers which aren’t supported by the app and Linux distros which don’t have an ExpressVPN app, there is a manual configuration option available which will allow users to access ExpressVPN’s functionality. BEST VPN FOR USTVNow:ExpressVPN is our #1 Choice. A super fast and reliable choice which unblocks USTVNow in any country as well as most other major streaming services. Best-in-class security and privacy with 256-bit AES encryption, keep no browser logs, kill switch and leak protection. Try it risk-free with the 30-day money back guarantee. NordVPN has over 1,700 servers in the US alone. This means that in addition to being able to unlock USTVNow movie rentals, users will be able to bypass content that is geo-locked to specific states in the US. Many servers are optimized for specific purposes, including fast streaming in HD. In addition to USTVNow, NordVPN works to unblock Netflix, Hulu, HBO, and other streaming services and networks. The service provides six simultaneous connections with a single account. NordVPN has a large database of tutorials and FAQs, and provides 24/7 live chat support and support via email. This provider looks after the privacy and security of its customers by not keeping any logs and using 256-bit AES encryption. DNS leak protection is also provided, which prevents DNS requests from being routed to your ISP and keeps them within NordVPN’s DNS servers. Moreover, there’s a kill switch built into NordVPN’s apps. This prevents any information being leaked to your ISP. IPv4 is also forced. In keeping with NordVPN’s security focus, payment is accepted via bitcoin and other cryptocurrencies, ensuring increased anonymity when compared to traditional payment methods. NordVPN can be used with a wide variety of devices. There are apps available for Android, Windows, MacOS, and iOS, and extensions for Chrome and Firefox. This translates to a multitude of options for securing your internet connection. You can also manually configure many devices for which there is no native app. BEST BUDGET VPN:NordVPN is a good value choice. A great value option which works reliably with USTVNow and most popular streaming sites. Connects up to 6 devices simultaneously. Top notch privacy and security. 30-day money back guarantee. CyberGhost offers fast connection speeds with more than 700 servers located in the US. This means that if you are outside of the US, accessing USTVNow’s movie rentals is no problem. In addition, CyberGhost also works for services such as Hulu and Showtime. Up to seven simultaneous connections are allowed. Your privacy is protected with this provider since it has a no-logs policy. In addition, traffic routed through the VPN servers is encrypted using the 256-bit AES standard. DNS and IPv6 leak protection is provided and there’s an automatic kill switch, so no data can be leaked to your ISP. Bitcoin payments are accepted which aids with keeping transactions anonymous. CyberGhost offers a comprehensive support page that provides guides, FAQs, and troubleshooting pages. If you require help from a human, you can submit a ticket or ping the 24/7 live chat support. CyberGhost VPN apps are available for Windows, MacOS, iOS and Android. You can manually configure with Linux and some routers. Over 700 servers in the US get around most geo-restrictions. BUDGET CHOICE:CyberGhost is great for beginners. Easy to use. Good server representation in the US makes them ideal for USTVNow. Stores no logs and streams HD video reliably. Can struggle with some other popular streaming sites. 45-day money back guarantee. PrivateVPN secures internet connections with the added benefit of enabling access to geo-restricted content. This includes unblocking USTVNow’s movie rental service outside of the US. PrivateVPN is also capable of providing access to the US Netflix library. There are ten servers located in the US that all provide fast streaming speeds. Moreover, six simultaneous connections are allowed with PrivateVPN which is quite convenient in this age of multi-device ownership. This provider keeps no logs of users’ data traffic, ensuring private user details remain that way. Added to that, 256-bit encryption is used to secure your connection. IPv6 leaks are prevented by forcing IPv4, and apps come with DNS leak protection and a kill switch. Bitcoin payments are accepted to allow for transactions that are virtually anonymous. In terms of customer service, PrivateVPN provides 24/7 live chat as well as remote control support. The latter can be particularly handy for users requiring assistance with setting up the VPN or general troubleshooting. Dedicated Windows, Android, MacOS, and iOS apps are available for PrivateVPN and it’s possible to manually configure Linux and supported wireless routers to work with the service. GREAT SPEED:PrivateVPN is a good family choice. Unblocks USTVNow. Good for browsing and torrenting. Could do with having more servers and lacks 24/7 support. 30-day money back guarantee. IPVanish offers fast connection speeds and over 650 servers located in the US. Accessing USTVNow’s movie rental service in other countries is easily achieved. IPVanish is also capable of unblocking Comedy Central and Hulu. This provider upped the ante recently with its device policy. You can now use up to ten devices simultaneously on a single subscription, which means all of the devices in a household can be accommodated easily. Connections made via IPVanish are secured using 256-bit encryption. Furthermore, this service provides DNS leak protection, and a kill switch is built-in for increased security. Users have the option of enabling IPv6 leak protection within the IPVanish app. No logs are kept of users’ data and Bitcoin payments are accepted, allowing for increased anonymity when compared to traditional payment methods. Customer service agents are available 24/7 via an email form, and a comprehensive knowledge base is provided on the IPVanish website. Native apps are available for Windows, MacOS, iOS, Android, FireTV, Windows Phone and some routers. The service can be manually set up on routers the native app doesn’t support and on Linux and Chromebook machines. Can I use a free VPN to rent movies on USTVNow? There are some free VPNs available that can be used to connect to US servers. However, there are some factors that need to be considered when using a free VPN. Generally, free VPNs don’t have a large server selection. There are also usually data caps, waiting queues, and limits on the amount of available bandwidth. In many cases, free VPN servers can become congested due to a large number of users attempting to take advantage of the free servers. Server overloading quickly leads to slow connection speeds. Moreover, from a privacy standpoint, using the services of some free VPN providers can be risky. Some of these providers tend to keep logs, run ads, and inject tracking cookies into your browser. Worst of all, some free VPNs can carry malware. This is especially true of free VPNs available for Android devices. For these reasons we typically recommend that users avoid free VPN services. Fire up the VPN software of your choice. Connect to a US VPN server. Close, reopen, and clear the cache of the software you’re using to access USTVNow. Afterward, you should be able to proceed with the movie rental. What else does USTVNow have to offer? USTVNow has lots of live TV options. With its free package you will have access to ABC, CBS, the CW, Fox, PBS and My 9. Even more live TV options are available with USTVNow’s paid packages, along with HD streams and DVR capability. The combination of live TV and on-demand options make USTVNow an attractive service for enjoying your favorite content without a traditional cable subscription.